It has become increasingly clear for me that teaching Paripurna Navasana and Ardha Navasana is a challenge while very, very pregnant. I cannot demo these postures what-so-ever. Truth be told, it is hard to find a student that gets it with just my verbal cues either the first time around. Second time around, there’s improvement but it seems to come from me providing more feedback on what we need to trouble-shoot from round one. So, good ole’ Light on Yoga can once again serve as a wonderful tool in getting a visual but also validate that I’m not trying to torture you. 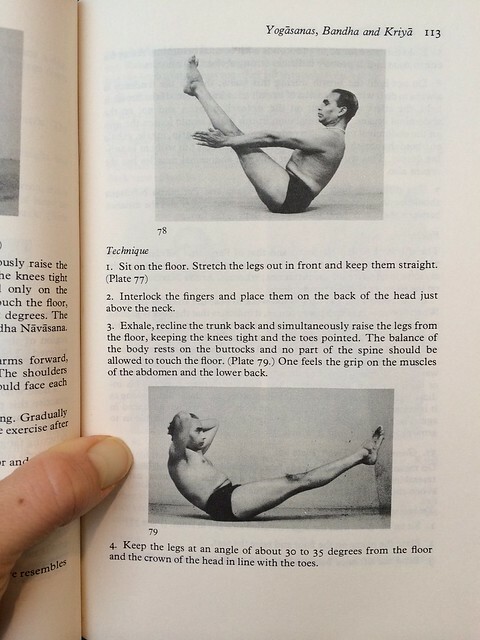 Iyengar clearly states to stay off the spine, and folks, that includes your sacrum and is counter to what you may have learned from your Pilates influenced teachers. What you are seeing below is Paripurna Navasana in the TOP photo and Ardha Navasana in the BOTTOM photo. The instructions or “Technique” that is in the photo provided is instructions for Ardha Navasana (notice plate 77 is referenced but my photo doesn’t include it). -In Paripurna Navasana the feet are higher than his head. -Ardha Navasana the feet are as high as his head. -Paripurna Navasana the spine is in an extended position. -Ardha Navasana the spine is flexed. -In BOTH he is exactly on the same spot of his bottom. -Iyengar almost looks happy in Ardha Navasana! Typically, what I see is students lay on their back and get low to the floor with their mid-back. Also, they raise the feet higher than the head. These can be super challenging if you have not properly set the thigh bone into the pelvis and your hip flexors do too much of the work. I will teach a sequence prior to navasana work that includes any of the following with great emphasis on moving the femur towards the back plane of the body: lunges, supta padangustasana, and basic standing yoga poses. Navasana work can also be extrememly counter intutive if you have diastasis recti. -Place your hands behind you, palms down, fingers pointed toward your bottom and touching. -Bend your elbows and lean back. Front body will grip as spine rounds (flexes). -Keep your hands on the floor and elbows bent while you maintain the position in the upper body. Now lift your legs with feet coming up just as high as your eye-line. -Lastly, maintain form and move your hands behind your head.